Our church was formed by believers who were concerned that most evangelical churches have departed from scriptural teachings to accommodate modern social trends. We are united in our belief in the Bible, the creeds of the church, and the teachings of the 16th century Protestant Reformation. In early 2011, I met Elmer Sarmiento, an accountant who lives in Imus and worked in Makati, via Facebook. He mentioned that he’s interested in starting a Bible study group in his home because he and his wife were very dissatisfied with the lack of Biblical preaching and teaching in their church and denomination. On June 18, Elmer and Cynthia Esguerra Sarmiento, Olive Esguerra Acasio and her two young sons, and Sarah Esguerra, met in the Acasios’ home in Bukandala, Imus, Cavite for our first Bible study. 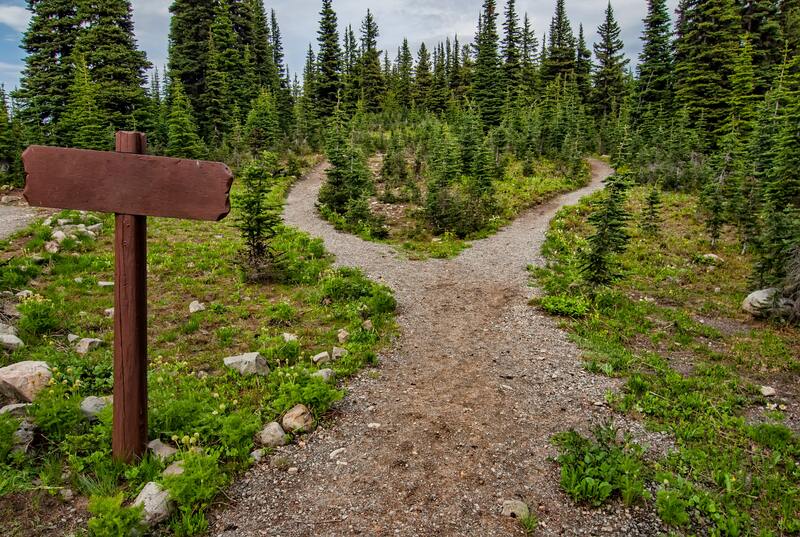 I started with Ephesians 1:3-14 (unconditional election), Romans 6:15-23 (total depravity), then to the other three points in the doctrines of grace in salvation. On August 6, we moved the Bible study to a rented room on the 4th floor of a building close to the house of Gani and Leah Ong, my sister-in-law, in nearby in Bacoor. We were joined by their two young sons and Gani’s parents, Rolando and Rosario Ong. These two families were also disgruntled with the prosperity gospel in their church. On September 11, this small group was joined by several other visitors in our first Lord’s Day worship service. Since many of these 20 worshippers were completely new to Reformed worship, I explained briefly the meaning of each significant element of the liturgy. A few of those who attended this first worship service became regular attendees. In March 2012, Pastor Jayson Santiago and his wife Tin-tin, who came from another Pentecostal denomination, started his ministry here, with only a promise of a small allowance. On September 23, 2012, we celebrated our first anniversary in the present 2nd floor location in the same building. Though our first year was not lacking in financial and attendance struggles, we gave praise and thanksgiving to God who was faithful in upholding our new church. We have had many visitors, and a few stay. The enticing and glamorous entertainment of big megachurches around us are much more attractive to them. The popularity of the prosperity gospel and moralistic, therapeutic sermons are more “relevant” and “authentic” to them than the true gospel of Christ. On May 5, 2013, the church celebrated its organization (particularization) with the installation of two elders, Ronald Fernando and Isaagani Ong, and two deacons, Elmer Sarmiento and Orlando Libres. On September 8, 2013, we had our Second Anniversary Worship and Celebration with Rev. Lance Filio as our guest preacher. On September 14, 2014, we celebrated our Third Anniversary, again inviting Rev. Filio as guest preacher. On May 19, 2013, we held our first worship service at our present location at Care Fitness Gym. We rejoice that this meeting place is more spacious, quiet, surrounded by greenery, close to the city’s marketplace, and much cheaper. In September 2014, the Consistory was pleased to call Rev. Lance Filio, former Associate Pastor of Baclaran Unida Evangelical Church, to be its Interim Pastor (part-time). And by the end of the year, December 2014, we organized our first joint Christmas service and dinner fellowship with our founding church in Pasig, Cainta. Beginning of the year 2015, we again held another joint worship and camping at Nature Discovery Camp, Tagaytay. This strengthened the bond of fellowship between the two churches. And by February 1, 2015, we set another milestone when moved our worship area to the 2nd floor building where until now we are holding our services. Our guest preacher then was Rev. Richard Bout. He preached about the important task and authority of the church of Jesus Christ. It has greatly encouraged the office-bearers of the church to continue with their task of being under shepherds of Christ for this congregation. With the pure preaching of the gospel, the proper administration of the sacrament and the practice of church discipline, the Lord has added to our numbers believers who were seeking to worship God as revealed in his Word. Inquirers of the reformed faith have professed their adherence to the creeds and confessions of the church and have become full pledged members of the church. Families, as led by the godly headship of their fathers, have transferred their membership, including their children, to our churches as well. And at the anniversary service, October 2015, the office-bearers of the consistory, together with Rev. Napoleon Narag, our guest preacher from Pearl of the Orient Reformed Church in San Pablo, installed Rev. Lance Filio as a full pledged minister of the Word and Sacrament. By the end of the year, November 2015, Rev. Allen Vander Pol conducted a seminar for the church on the importance and practice of Biblical Worship. This again encouraged the whole congregation to answer the challenge of contemporary worship of the modern churches of our day and reminded that the worship of God should be regulated only by God’s Word in Scripture. The year ended, December 2015, with another joint Christmas service and dinner fellowship where our guest preacher was Rev. Paulo Vasquez of Unida Church, who later become the minister of the Pasig congregation. During this same event, Clark Añora was installed as deacon of the church. As we look forward to the future, we praise God for his faithfulness in building up the church through “the apostles’ teaching and fellowship, the breaking of bread, and the prayers.” If the Lord wills, we plan to move to a more affordable place, have morning and evening services with catechism classes and fellowship in between, and invite the surrounding community to a new midweek Bible study. Our desire is to disciple the members of Zion Cornerstone Reformed Church into mature Christians, and proclaim the true gospel to “inquirers” who visit us. In February 2016, Rev. John Bouwers from URC in Jordan, Canada, organized by our brothers in CanRC, conducted a whole day seminar about “The Golden Chain of our Salvation”. He explained on this event the great doctrine of grace as found in one of great confessions, the Canons of Dort. The event was attended by mostly young Christian students who were eager to hear the message of the gospel of grace. In March 2016, prayer meeting every 2nd and 4th Saturday of the month was organized and until now continually bring spiritual encouragement and guidance to the church. At that same month, God answered our prayer when we finally had our SEC registration approved. 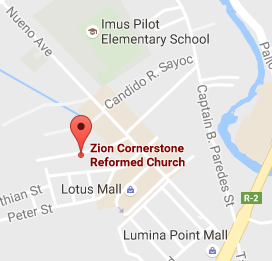 Imus and Pasig congregation were finally organized as two separate consistories and formed one classis under the new name, Zion Cornerstone Reformed Churches. And by the summer of that same year, May 2016, the classis organized a joint retreat held at Rizal Re-creation Center, Laguna. The theme of the retreat was about the importance of being a confession church as our reformed witness to the world. And by the end of that year, December 2016, we held another joint Christmas service and dinner fellowship. We had our special guest preacher, our founding pastor, Rev. Nollie Malabuyo. He also led the installation of our new deacon, Jeremiah Paul Manuel. The year 2017 began with installation of new elder, Andy Domodon. It was indeed a blessing for the church to have men who are answering the call for ministry for his church. And during the summer of this year, April 2017, we organized an outdoor Tenebre Good Friday service at the residence of Hans and Rosie Tolsma up North of Manila, Ilocos Norte. The fellowship of the whole church with the family great encouraged everyone in the reformed faith. This year 2018, God continues to grow his kingdom through the ordinary means of grace. At the beginning of the year, several individuals coming from evangelical and Pentecostal background become members of the church after completing an inquirer’s class and professing faith in front of the congregation. An entire family household joined as well. The believing parents submitted their children to infant baptism and received the sign of God’s promise of salvation in Christ. At the middle of the year, the consistory decided for the congregation to begin spending the whole of Lord’s Day from morning to afternoon. All worships twice every Lord’s Day including Sunday school and Prayer meeting. This was also the time when several activities were held. Understanding Scripture was conducted for current and future leaders of the church while Canons of Dort catechism was conducted for the young members. And finally pushing towards the end of the year, an election was held to determine the next set of serving elders and deacons. Those who were selected are: for Elders – Ronald Fernando, Isagani Ong and Andy Domondon; Deacons – Clark Anora, JP Manuel and Elmer Sarmiento. Today, we average between 45-60 souls every Lord’s Day. The Lord has added to our number believers who come from as far away as Trece Martires, Dasmarinas and Las Pinas. May the Lord continue to bless his people with the preaching of the Gospel, administration of the Sacrament and church discipline. Amen. So you or your friends live who live in the area are cordially invited to our worship services and other activities on the Lord’s Day. You may leave a comment here or email me at: lance.filio@gmail.com. Pastor Lance Filio is an ordained minister in the Unida Evangelical Church, and served as Pastor at Baclaran Unida Evangelical Church. He is also currently Research and Product Development Manager at Sky Cable. He has a Bachelor’s degree in Electronics and Communications Engineering from Mapua Institute of Technology, and is currently working towards an Master of Theological Studies at MINTS International Seminary. His pastoral training is with ASCM and Unida Lay Leaders Institute. He lives in Paranaque with his wife Nikki and three boys, Lance Malachi, Amos Echad and Nate Shadrach. Pastor Nollie Malabuyo is an ordained Associate Pastor of Trinity United Reformed Church in Concord, California. You can read more about the URCNA here. In 2008, he was sent as a missionary-pastor to the Philippines. Pastor Nollie received his Bachelor’s degree in Mechanical Engineering from the University of the Philippines in Diliman, Quezon City in 1973 and Master of Divinity from Westminster Seminary in California (Escondido) in 2005. From 1976-95, Pastor Nollie worked as a professional engineer for various engineering companies in the U.S. In 1995, God called him as a missionary back to the Philippines under Wycliffe Bible Translators, serving as a computer specialist until 2008. He also taught various Biblical and theological classes at Presbyterian Theological Seminary and Unida Biblical Seminary, both in Cavite Province, from 2005-09. Pastor Nollie lives just outside Metro Manila with his wife and daughter. Their three older boys live and work in California.